How to Remodel Your Bathroom without Breaking Your Budget – Part 2 of 2 - Nowthen Plumbing, Inc. Decide where you’re willing and able to contribute sweat equity and make time to do those things yourself. Clarify up front with you contractor which projects you’ll handle and then follow through within the project’s timeline. Don’t be tempted to take on projects that are way beyond your skill level (that’s what professional are for), but know that even little jobs can save you big dough. Painting the walls could save you around $200 and even screwing in the towel bars yourself may save you $20 or more. Just because you’re looking forward to your contemporary new bathroom design doesn’t mean you should lose focus of things behind-the-scenes. Bathroom ventilation for example is crucial to get right, and installing a good system will save you money down the line when you avoid mold and mildew growth. Without good ventilation, excessive humidity can also damage cabinets and paint finishes. Installing interesting and practical lighting is a cost-effective way to add punch to your bathroom in comparison with other expensive fixtures or pricey amenities. Practical and ample lighting will make everyday grooming easier and will give the room a welcoming and spacious feel. Consider task lighting surrounding mirrors or under-cabinet bathroom lighting to make finding those towels just a tad easier. 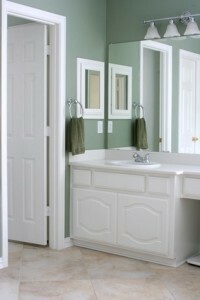 It is possible to remodel your bathroom without breaking the bank! Now that you know a bathroom remodel is in reach, get the ideas flowing today! For more inspiration, check out these affordable bathroom makeovers featured on hgtv. Ready to get started? Let Nowthen plumbing help! Quality and affordable residential and commercial plumbing, serving the surrounding areas of Elk River, Anoka, and the south & east suburbs of the Twin Cities. Contact us today!